What Happens to Brownies If You Add Too Much Water? Brownie mixes are simple to use, but require exact measurements for success. Adding too much water can result in brownies that can't hold their shape or have a diluted flavor. Read the directions carefully before you begin and make sure you're not transposing the water and oil quantities. Brownie mixes require 1/4 to 1/2 cup water, depending on the brand. 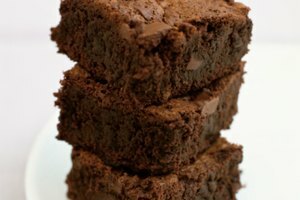 When brownies have too much water, they don't brown properly and they have a mushy, soggy quality. They may not hold together, falling apart when handled, or they may seem oily. Properly prepared brownie batter has a smooth, thick consistency. If the batter is thin or watery, you've added too much water. Homemade brownies usually don't contain water, relying on eggs and oil or butter for moisture. If the batter seems runny, add a few tablespoons flour to thicken it. Add the flour one tablespoon at a time, mixing the batter completely before adding another. Too much flour can lead to tough, dry brownies. If your batter is still watery after adding 4 tablespoons, it is probably best to start a fresh batch. 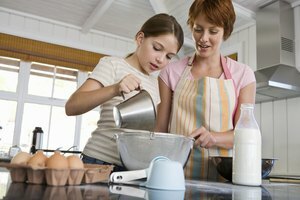 Although you may be able to fudge measurements and ingredients when cooking meats and main dishes, baking requires exact measurements for success. Read the directions carefully and double check each ingredient and amount before adding to the mixture. If your brownies taste fine but come out less-than-perfect looking due to the excess water, dress them up with a few simple ingredients. Spread a thin layer of cream cheese frosting or drizzle melted chocolate or white chocolate over the cooled brownies.